A 2-year old girl from Matanur, Parvathy has been battling chronic kidney illness almost all her life now. 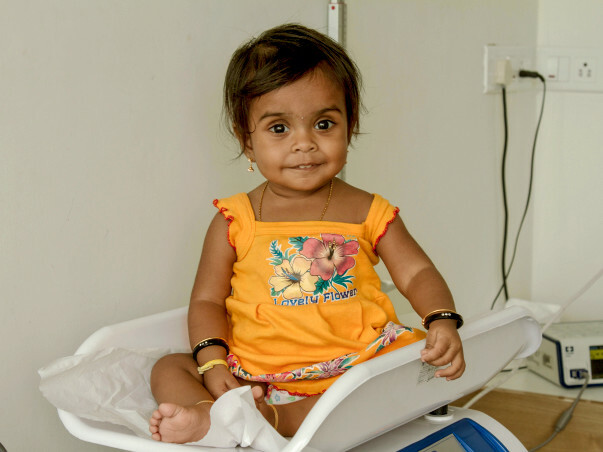 The first symptoms showed when she was just 3 months old, as bouts of fits and persistent vomiting; and she was diagnosed with Chronic Kidney Failiure. Her kidneys were poorly formed and not functioning. Her doctors decided to perform daily Peritoneal Dialysis on her until she reached an age and weight to withstand a transplant surgery. Daily Peritoneal Dialysis was performed at her home, under the watchful eyes of her mother. Parvathy started looking healthier, she gained weight and became a cheerful kid. Unfortunately, during one the dialysis, she developed intestinal strangulation that required immediate surgery. Post surgical infections and complications made further Peritoneal Dialysis impossible; and she had to start undergoing Haemodialysis. A complex procedure that cannot be performed at home and long period of time, things started getting worse and worse for Parvathy. Her condition is getting worse by the day. The only way out now is a transplant, which has been scheduled for the second week of September. 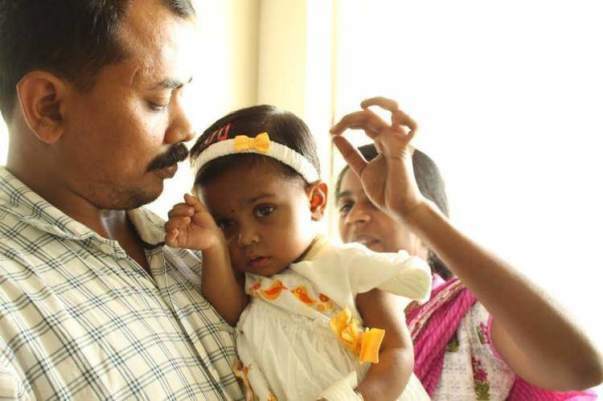 Though her grandmother is a perfect match as donor, her family is in a fix, as they have no resources to fund the surgery and post transplant care, which will cost them more than 6 Lakhs. Shinu, who was a driver in the Middle East was forced to resign his job to look after Parvathy, as it was impossible for Saritha to manage on her own. Parvathy’s treatment till now was possible only because of support from friends and extended family; but an amount that runs into Lakhs is way beyond their reach. The only option for BP to survive is to perform the kidney transplant immediately and the same is scheduled for the second week of September. Her grandmother will be the donor. The family has pooled all their resources and relied on the contribution of friends and extended family to fund the medical expenses so far. Shinu has had to resign his job to help look after his daughter. This leaves the family without a breadwinner. The transplant will not just save the life of a two year old but will help the family get their lives back on track. I met Parvathy and her family when i was volunteering in this hospital during my school holidays. I saw the difficult situation the family is in and felt a pressing need to help the family as much as I can. I started this campagin to rasie as much funds as I can to support Parvathy. So please donate, not only because she needs the money for the transplant to take place, but also because she deserves to see the world like you and me. We have a great news to share. 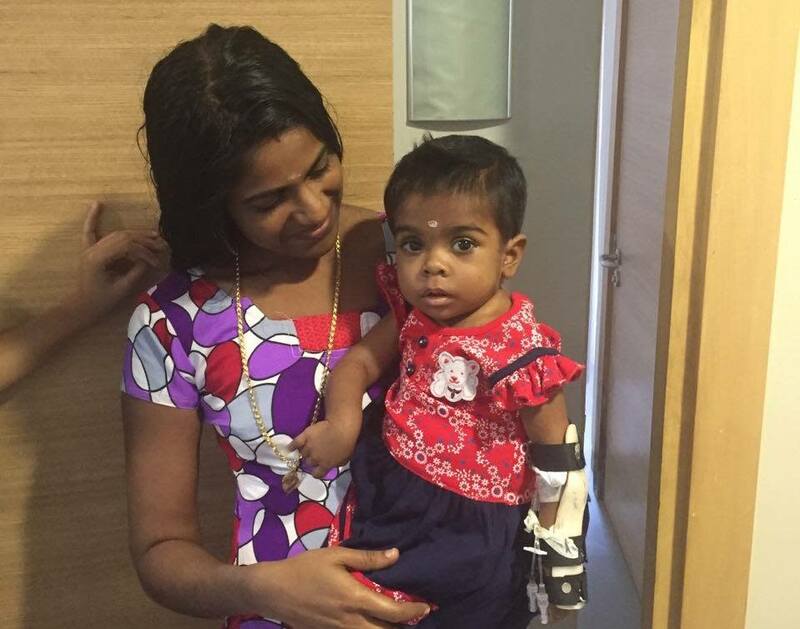 Parvathy was discharged from the hospital on January 5th. She is recovering well. Thank you for your amazing support and prayers. 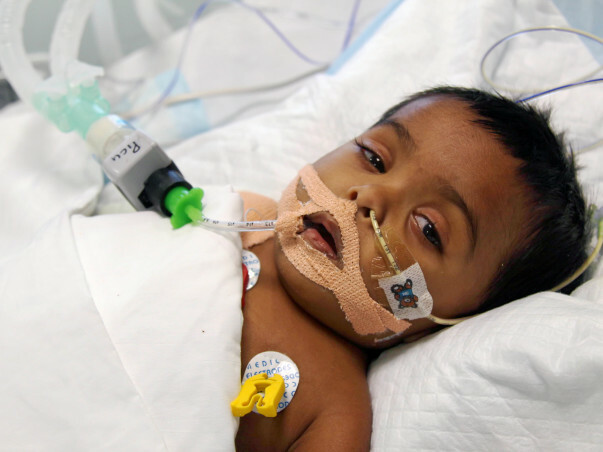 Parvathys liver and kidney transplant took place this Wednesday 16th of November. Her dad and her grandmother were the organ donors. The surgery took almost 22 hours and she is currently in the PICU. The surgery went well with no complications and she is stable. Please do keep Parvathy in your prayers. Thank you for the support and donations. 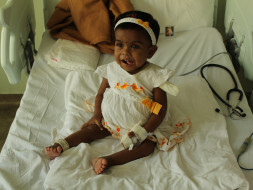 Parvathy is continuing to get her daily dialysis. Her family has been screened for a matching donor for Liver tranplant. Her father has been identified as a potential donor. However, he is not fit for donation at this point as he is overweight. 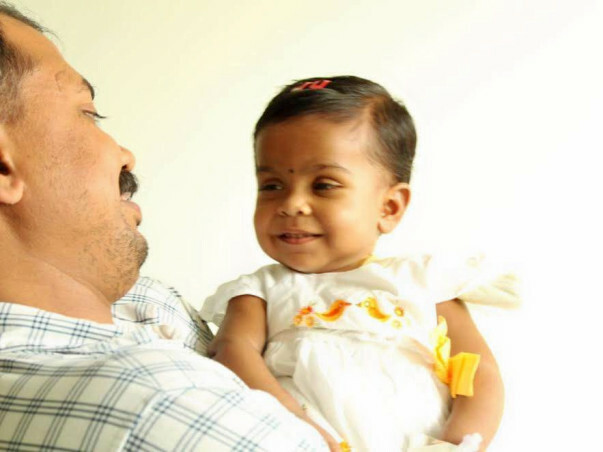 Father is on a special weight loss programme to try and loose weight so that he can donate his liver to parvathy. 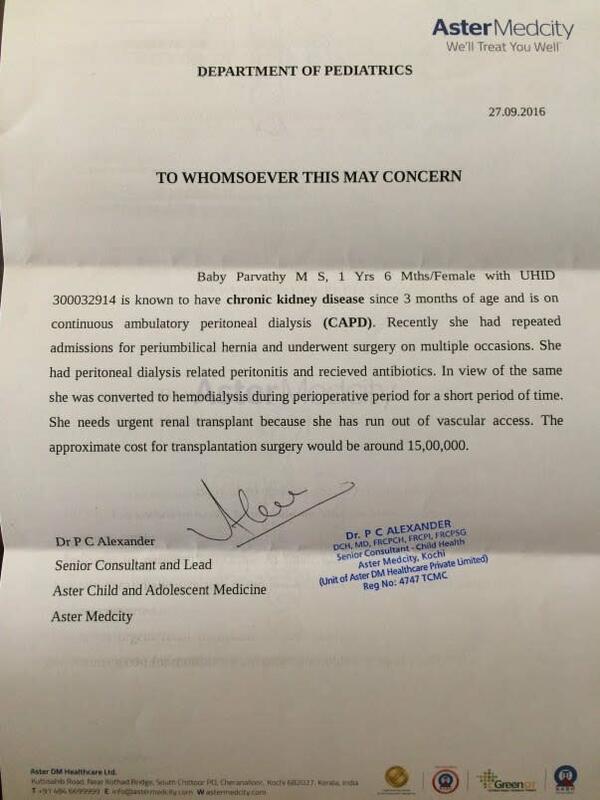 Meanwhile, She is also listed with KNOS ( The Kerala state agency which co ordinates organ donation) as a recipent . Keep Parvathy in your Prayers. May Baby Parvathi recover soon.